Google Hangouts is an amazing tool for keeping in touch with groups of people with a shared interest–students, colleagues, or even a professional network. Unfortunately, Google plans to phase out the platform by October of 2019. So what can you use in its place? There are actually quite a few options that can fit the bill. 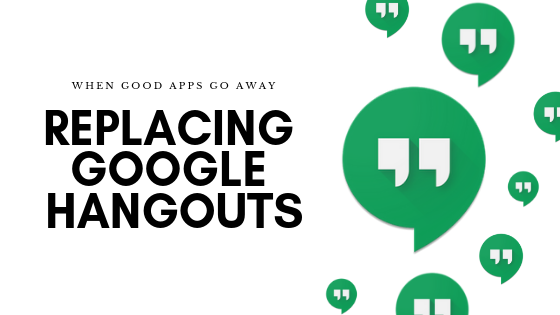 Here, we’ll explain just what’s happening with Google Hangouts and explore the best tools to use once Hangouts goes to the tech graveyard. In late 2018, Google announced its intention to retire the popular Hangouts app. Of course, Google Hangouts won’t be just disappearing– it will be replaced by two tools: Google Chat and Google Meet (two are better than one, we guess?). This change won’t happen until the end of 2019 or early 2020, which gives you some time to migrate your conversations somewhere else if you choose to do so. So where to go? What you choose will be based on how you plan to use the chat service, how you want it integrated, and who you’re going to be talking with. If you had previously been using Google Hangouts as a tool to keep in touch with students or other COD employees, our choice for a replacement is Blackboard Collaborate Ultra. What’s Ultra have going for it? Well, for one, it’s already integrated into every course you have here on campus. There’s no extra app needed. It also has a pretty great range of functionality. You’ll find whiteboards, chats, video conferencing, break out rooms, easy document sharing, and more. Collaborate is easy to use and free (you can even share the link for a Collaborate session with a non-COD individual to invite them to join). Need help getting started? Give us a call! We’d be happy to show you how it works. Those who use Google and want to stick with Google products will want to check out these communication tools. They’re designed to replace all the functionality of Hangouts, and possibly, then some. Duo is Google’s video chat app. Duo works seamlessly on either a computer or mobile device, allowing one touch video chats. For those looking to hold virtual office hours or chat with colleagues outside of the office, this offers an easy way to do that. Hangouts chat is integrated into G Suite, so if you use that you’ll appreciate how easy it is to share slides, set up video conferences, or work together on a document. It’s a collaboration tool, very similar to Hangouts, that Google intends to be its direct replacement at the end of this year. It offers features like direct messages, group conversations, virtual rooms, threaded conversations, and more. If you loved the old school version of Hangouts, this is the most natural choice going forward. If you’re in need of a video conferencing tool, Meet is Google’s offering to the market. You can create scheduled meetings and invite anyone (up to 10 users) via a shared code. Meet is basic, but incredibly easy to use and even a new user should be able to get up and running within minutes. Want to move away from the fickle mistress that is Google? You’ll find plenty of tools ready and waiting to give you the tools you need to chat, share, and collaborate. Slack is one of the most popular collaboration tools out there today, and for good reason. It’s easy to integrate into the tools and services you already use (Goolgle, Dropbox, etc) and it makes staying organized easy, as you can create and break up channels however it best suits your needs. There’s integrated file sharing and video calls and you can quickly share any ongoing conversations you have with just about anyone. This app, for Android, iPhone or desktop, is a secure tool for making video or audio calls, holding text chats, and sharing documents. It does just about everything the current Google Hangouts does, so it’s a good option for a free collaboration tool. Telegram has a native app for every platform and device. It’s private, cloud-based, and free, making it very comparable to Hangouts. Groups can have as many as 200,000 members and it’s easy to share and store any kind of content you need for personal or professional endeavors. Riot is another great replacement tool for Hangouts, offering a wealth of integrations, highly adaptable communication tools (you can chat, share files, add widgets, make video calls, etc), and overall security. Essentially, everything you were doing with Hangouts, you can do with Riot. This entry was posted in Guides, Tech to Try and tagged Google. Bookmark the permalink.